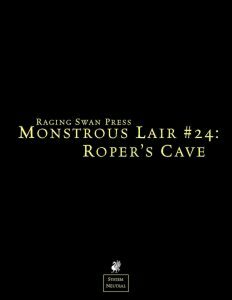 All righty, this time around, we check out the approach to a roper’s cavern – being ambush predators, what can we find? Well, wide marks on the floor, their trails, for example. Craggy rocks with many niches…or a rotting piece of strand, cut off in a struggle. A dwarven graffiti may warn folks away…but yeah, by necessity, nothing to peculiar. (As an aside: Easily discernible tracks are not something I’ve seen any book dealing with ropers feature – that may provide a lore-conflict, so beware with that entry!) When the PCs happen upon the roper, he may be sleeping. Or Shamming sleep. (How does an ambush predator fake being asleep? Snoring gives it kinda away…) More interesting would be the entry that sees the roper scratch sigils into the walls, but from scratching against the walls to eating/lording over vanquished foes, not much going on here. Major lair features include chasms with rubbish and detritus, high escarpments, ledges, unsafe entrance ceilings or stalactites prepped to fall. Quite a few of these focus on giving the roper an advantage, which is a good thing here. Minor features consist of e.g. swarms of blind bats, cool breezes, phosphorescent lichen and the like – here, the pdf is once more pretty noncommittal. The roper’s appearance may include tendrils with mottled patterns, splintered fangs, odd dimensions, being obviously sick…or weirdly-shaped, there are some nice ones here. The treasure-table includes severed hands still grasping swords, deformed lumps of platinum, rusting lanterns with yet enduring magical light and more. The final table includes skeletons of mules and owners, hollows hiding tangled messes of bones and rubbish, splintered shards of once sturdy shields or upturned boots hanging from a tall stalagmite. Robert Manson didn’t have an easy job here – as ambush predators, ropers are hard, and they are not exactly a creature that brims with lore written about it. That being said, I consider this to be an okay dressing file; the trails are a bit weird, and a couple of the appearances wreck camouflage attempts, which is somewhat strange. All in all, this is an okay, offering, and as such, my final verdict will be 3 stars.